May 10, 2017 by Karen C.
No issues whatsoever. My table shipped even earlier than I expected. I would definitely order from this company again. 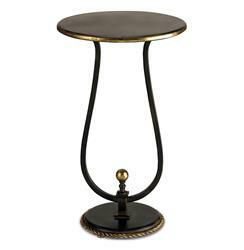 An eccentric wrought iron side table with gold leaf accents is simply enhanced with a braided iron at base and gold sphere finial. Supported by a delicate single curved line with a round top slightly larger than the base results in a wonderfully petite table exuding femininity.